Vintage - Ridgway Potteries LTD., of England, Miramar White Mist Pattern, Tea Set with Service for Six (21-Pieces), Circa 1955-64. 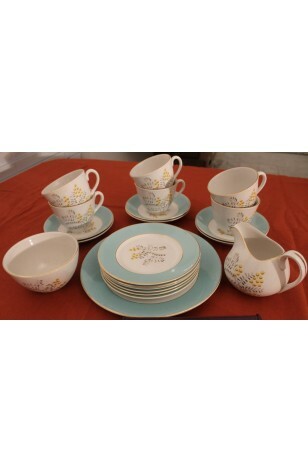 A great Tea Set for Six, made in England by Ridgway Potteries, LTD, in a Pattern known as "Miramar White Mist". Beautiful Wide Aqua Blue Rims on Plates, with Centers of Fern Leaves with Yellow Berries. Plates have 22kt Gold Verges, and all Pieces are Trimmed in 22kt Gold on the Rims. Great Condition. A great Tea Set for Six, made in England by Ridgway Potteries, LTD, in a Pattern known as "Miramar White Mist". Beautiful Wide Aqua Blue Rims on Plates, with Centers of Fern Leaves with Yellow Berries. Plates have 22kt Gold Verges, and all Pieces are Trimmed in 22kt Gold on the Rims. Great Resale Condition unless noted below or in pictures.